Since the early 2000s when Research Associate Shawn Padgett pioneered the use of video cameras on nests to read bands, the Center for Conservation Biology (CCB) and other groups have used camera traps to identify breeding adult peregrine falcons. The practice has helped researchers to finally address a long list of questions about peregrines, including how long they live, said Bryan Watts, director of the CCB. “Natal dispersal” is the term used to describe the movement of an animal from place of birth to the location where it will ultimately breed. For the majority of bird species, dispersal progresses through three phases, said Watts: a decision to leave the natal territory, a transition that includes exploration or prospecting and a decision about where to settle or establish their own breeding territory. Of these three phases, most is known about when young birds leave their natal territories, Watts added. Less is known about prospecting and, for many species, even less about where young birds ultimately settle. Peregrine falcons are famous for having an extended and dramatic period of exploration. Their very name comes from their wide peregrinations. In stark contrast to these extensive wanderings, when it comes to establishing breeding territories, peregrines actually settle relatively close to their natal sites, researchers discovered. For more than two decades, a large portion of the peregrine falcons produced in eastern North America have been marked with two bands including a United States Geological Survey (USGS) aluminum band with a numeric code and a field-readable band with unique combinations of letters and numbers. In most instances, reading the USGS band requires that the bird be captured. However, the field-readable band may be read using spotting scopes, binoculars or cameras. The use of these bands has allowed the community of biologists (and the public) to resight these birds over time and to contribute a great deal to what is known about falcon spatial ecology and natural history, Watts said. CCB researchers now have some data on how long peregrines live and the degree of relatedness within the breeding population — the researchers have documented close inbreeding between siblings and parent-offspring pairings. Camera-trap technology has also led to insights on lifetime reproductive success and patterns of dispersal, among others aspects of peregrine lifestyle. As is the case in many other raptor species, dispersal serves to reduce the likelihood of pairings between parents and offspring, Watts said. In addition, differences in dispersal distances between males and females makes pairings between full siblings less likely. 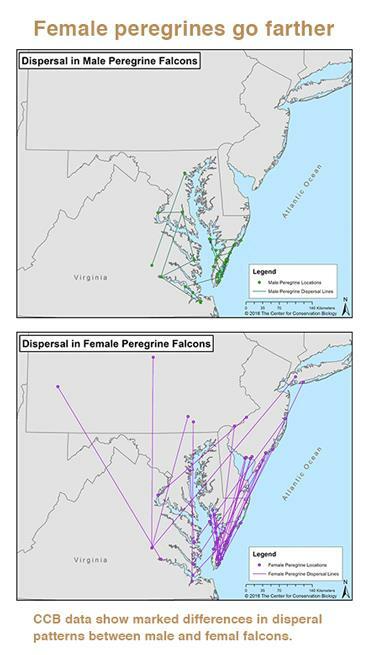 Dispersal distances documented by CCB and partners within coastal Virginia range from 4 to 207 kilometers for males (median of 24 km) and 0 to 473 kilometers for females (median of 105 km). Those involved with the banding and resighting efforts in Virginia are building an integrated database that is beginning to untangle several aspects of peregrine ecology that have been notoriously difficult to address, Watts said. The Center for Conservation Biology is a joint program of Virginia Commonwealth University and William & Mary.